Every time I buy a Dum-Dums product I get the song from their 90's commercial stuck in my head. Looking back, I feel like that commercial and the Blow Pop one were always being shown on Nickelodeon! I can still recite them both from heart, along with the kickass song from the Crossfire commercial! 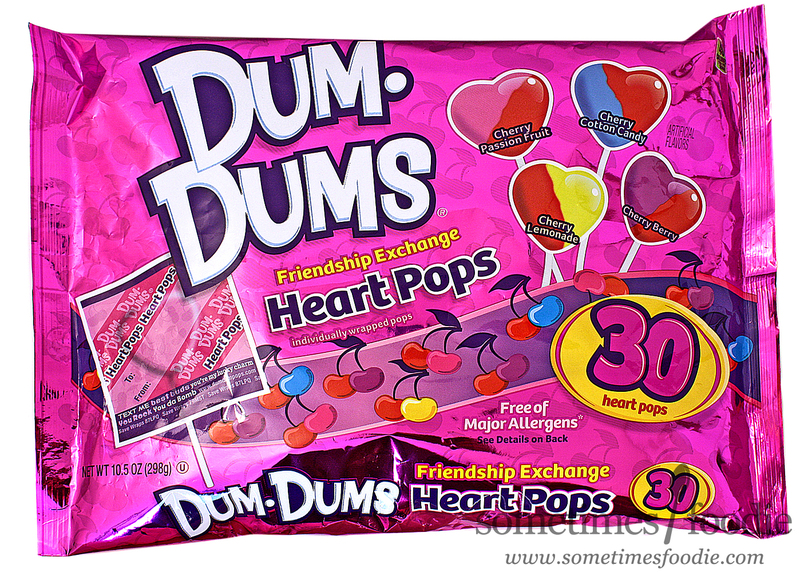 Dum-Dums lollipops have been around for quite some time but they aren't letting their brand get stale. They've been having some fun releasing pizza, bacon, and buttered popcorn flavored lollipops, some jelly bean centered candies for Easter, and now these new Heart-shaped pops offer two flavors in one. The packaging is really eye-catching. Not only are the colors bright, but that bold magenta backdrop is metallic! Which is something that really made this bag stand out from the others in the seasonal aisle. In person the metallic sheen is really appealing, but photographing this thing and NOT getting any glare from any of my lights was a challenge. I mean, the general public wouldn't consider that an issue, but I felt it was worth mentioning. Inside the bag we have 4 flavor combinations. Cherry Berry (red and purple) - The berry portion reminds me a little bit of the blueberry Lifesavers cream pops I used to eat as a kid. It's got a deeper berry flavor, which is stronger than the cherry, so the overall taste is sweet, slightly tangy, and mild. I liked this one a lot, and it had a much deeper and more complex flavor than the others. I tried to see if I could find hidden images and shapes in the candy swirls (for fun) and this one looks like the Grimace from McDonald's is poping out of the ceiling to spy on me. 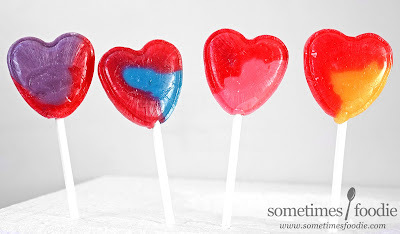 Cherry Cotton Candy (red and blue) - For this combination, the cherry flavoring is the most prominent of the two, but the cotton candy portion takes the edge off of the artificial tang that cherry candies tend to have. 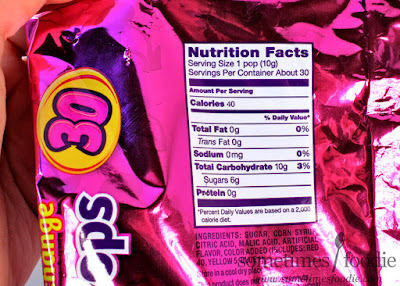 The end result is a slightly more mild cherry flavored lollipop which was okay, but not my favorite. This blue shape looks kind of...inappropriate. Right? I'll say no more. Cherry Passionfruit (red and pink) - Passionfruit isn't pink, but okay. At first, this one was my least favorite of the four. The pink portion tasted like the slightly bitter rind of a cantaloupe or honeydew melon mixed with grapefruit juice, but as it mixed with the cherry flavoring I started to like it's complexity. It was a nice change of pace from the other sweeter and more mild combinations, but I can't see little kids liking this one right off the bat. Okay, picture time! This one next to the blue one looks really...bad too. I gotta get my mind out of the gutter. Cherry Lemonade (red and yellow) - A very classic flavor. This one has all of the tart and tang of a classic artificial cherry mixed in with a sweet but slightly sour lemonade. It's nothing fancy or new, but I really liked this one. Although I wish it were a bit more sour. Still, this is my favorite of the four. This one kind of looks like part of a yellow start against a red background...like Steven Universe's shirt! That's pretty cool. Overall, not a bad mix. (If you like cherry, which I do.) I'm glad I bought them, and these will be great to throw into my purse and share with my friends and coworkers later this week.